So I saw this recipe on Facebook for a superhealthy cookie with mashed bananas as the base and I made them (substituting the raisins—blech!—with dried sour cherries—yum!). But they were…not that great. However, I really liked the concept, which results in a treat that’s as much a “bar” (as my kids call them) as a cookie, and I was determined to make them to the whole family’s liking. So I fiddled around and came up with this version that has been deemed “very good,” and my teenage daughter walked out the door this morning to catch the bus with one in her hand—and mouth. This cookie has no dairy, so technically it’s vegan. There’s also no gluten, so technically it’s gluten free, too! And the only fat is the good stuff in peanuts and coconut. Feel free to doctor it up to your own liking. We also decided the cookies are best stored in the fridge. Banana, Peanut, Chocolate, Coconut Super Cookie! Spoon the dough onto a greased cookie tray (I greased mine with coconut oil spray). 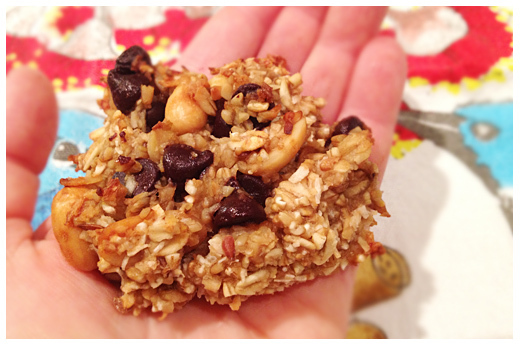 6 Responses to Banana-Peanut-Chocolate-Coconut Super Cookie! I made a double batch of these to take along to the beach this weekend (I’ll probably end up freezing some, too). They’re yummy. Because it’s what I had, I substituted carob chips for the chocolate and some cashews and walnuts for the peanuts. I made a double batch of these over the weekend too and they were delicious. I used almonds and instead of peanuts and then added some protein powder. Great about of carbs, sugar and protein to help sustain me on a long bike ride this weekend. Thanks! Any substitutions for the coconut you can recommend? Hi.. when you say coconut.. do you mean shredded coconut? Re above comments for coconut, I would say the shredded coconut is optional especially if you use almonds instead of peanuts and the use almond milk instead of coconut milk. The optional use of protein powder is dynamite!